Innovator. Pioneer. Originator. These are words that are thrown around all too often in the discussion of dance music artists. Jesse Saunders, however, is truly the culmination of all three. As a major catalyst in the development of the Chicago dance music scene and the producer of the first ever house music record released, the global house music phenomenon may have never come to be had it not been for Jesse’s contribution and continued vision. As he is welcomed by Manifest to perform for their ‘The House Chicago Built” event, 312 Audio accepted the opportunity to discuss his career and contributions to the genre that unites us all. John C: You were first exposed to the night club scene of Chicago during your teenage years, including artists such as Frankie Knuckles. What do you remember attracted you the most during those years? Jesse Saunders: I wasn’t really exposed at the age of 15 (when I started DJing), although I did get a chance to sneak into the Warehouse at 16 when Bob Peters from the Doctors dance organization (of Mendel fame) threw an event there. The only reason why I went was to hear this Soulful disco style of music that my brother Wayne Williams had been talking about, which influenced us to play that style to my high school peers. I didn’t really get to go out to clubs until I was 18 at which time I could actually go to the warehouse! What attracted me at that point was the fact that all my friends wanted to go as well, so we created this scene within a scene that blossomed into being what we created at The Loft, Sauers, the Playground, First Impressions, the Blue gargoyle, the Tree of life and more! Prior to being 18, we would stand outside the warehouse or sit in our cars and just listen to the booming sound from the 7-foot subwoofers that emanated from it. John C: You have previously credited your step brother as being a mentor to you as a DJ. What was the experience of being able to work with a sibling and eventually grow together as artists? Jesse Saunders: I am an only child by my mother. I grew up with my maternal side of the family in what I call “the compound” which consisted of a few buildings together, all fenced in, and having a happy life! So Wayne is my step brother (he is my half-sisters half-brother). My sister and I share the same father and Wayne and my sister share the same mother. Wayne used to come around and we hung out and went to the same high school. I think he wanted to have a brother because all he grew up with was a sister. So Wayne and I actually became the closest of all my paternal side of the family. By the time we reached high school he realize that I technically had mad skills in music and an ear for innovation. He felt that I would be an asset to him as a DJ. He previously had started the Chosen Few with Batman, Jamie Shelton and Ewert Abner (who was my sister’s boyfriend at the time). Somehow or another they fell off and Wayne, wanting to continue, brought me in so we renamed ourselves The Chosen Few Disco Corporation. Wayne taught me how to use two turntables and a mixer to blend and mix records together seamlessly. But I didn’t stop there. I wanted to know all the tricks that could be done: the back spins, the cutting, the remixing live and so on and so forth. So I taught myself that. Having my brother there to mentor me and point me in the direction that I needed to go was essential, I feel, in my development in becoming a great DJ! Becoming what we have become as the Chosen Few is something that even now is still hard to comprehend. We started something in the seventies that has grown into a worldwide phenomenon and I still sit on the stage looking at all the people wondering how we ever got here! John C: What inspired you to open up your own club, the Playground, and how did you try to differentiate it from other clubs? Jesse Saunders: Craig Thompson and I saw that a group featuring Vince Lawrence had thrown a party at Sauers and it was very successful. Sauers held about 700 people and their event was packed. So being the entrepreneurs that we were we decided to go buy up all the dates and throw parties there similar to what they did. We had a good run of about a year, but we decided that it would be better if we had our own place where we can reap all the benefits of concessions and regulate the type of parties and hours and such that we wanted. So it was actually Craig and Butch Thompson that found the space, signed the lease and brought me in as a partial owner. What we wanted to do was bring all sides of town together, because as I’m sure you know Chicago was very segregated at the time. We felt that not only the south side should be a part of what we were doing, but the north and west sides as well, and we succeeded at that because we brought in an element of people that never would have otherwise been partying together. This enabled me to play all styles of music which growing up as a classic rock baby, and then finding Soulful R&B, NuWave, and subsequently disco and more, fit right into my style. It was at the playground that I started experimenting with drum machines and different beat tracks, sounds, acapellas and more. This inspired me to create the world’s first house record known as “On and On!” The playground was also one of the first venues that I performed as an artist. John C: You are credited with releasing the first house record, On & On, and began releasing music regularly from that point onward. Do you recall what inspired you to begin producing music rather than just continuing to DJ? Jesse Saunders: Since the playground was such a high-profile venue, I would get record promoters coming through and giving me records all the time. Being able to play major artist records (of course the remixes only, not the cheesy radio versions), inspired me to want to explore the world of production and making my own record. John C: The ‘Chosen Few Disco Corp’ is perhaps one of the most impactful DJ collectives to have been created in the city of Chicago. What was the incentive for bringing the crew together at the time? Jesse Saunders: As I stated earlier, The Chosen Few Disco Corporation was an idea that Wayne had and brought me in on, because we were doing things that no other DJs were doing in the city. But today we are no longer called Disco Corporation, we are just called The Chosen Few DJs. The idea today is to have the most influential DJs in Chicago be chosen! We get many people inquiring as to how to be a Chosen Few DJ, but we don’t go by who wants to be, we go by who is chosen by us as being an influencer. We have only added two additional members since our original lineup from back in the late 70s and early 80s. John C: Speaking of ‘Chosen Few,’ the festival has become quite a success and each year brings together tens of thousands of house heads to celebrate the genre. In your opinion, what has allowed for the festival to become so successful? Jesse Saunders: What has allowed us to grow as a festival was that we never tried to be a festival. All that we did originally back in 1989 was to throw an event that would commemorate the times we had 10 years prior as kids growing up in the Disco / house music scene. Alan King, Tony Hatchett, Kim Parham and I threw an event in December of 1989. The temperature was below zero and the Loft that we chose had no heat with the exception of a space heater in a 1500 square foot space. But the event itself was such a success that we decided to continue it the following summer! The Hatchet family, of which two of our members Andre and Tony are part of, used to have a July 4th picnic behind the Museum of Science and Industry. So we decided to bring out some turntables and a mixer and just play music during the picnic. Those days were fun because there were only 40 or 50 people and there was lots of space to play softball, football and and just run around, laugh,enjoy fellowship with each other and share memories of what it was like growing up house! As the years flew by, more and more people would start to come because it was like a reunion of sorts. So we started calling it The House Music Reunion picnic. By the turn of the century, we were up to about 500 people or more and by 2006, we were in the thousands. At that point the park district who would just give us a simple permit decided that we were too big and we needed to move. 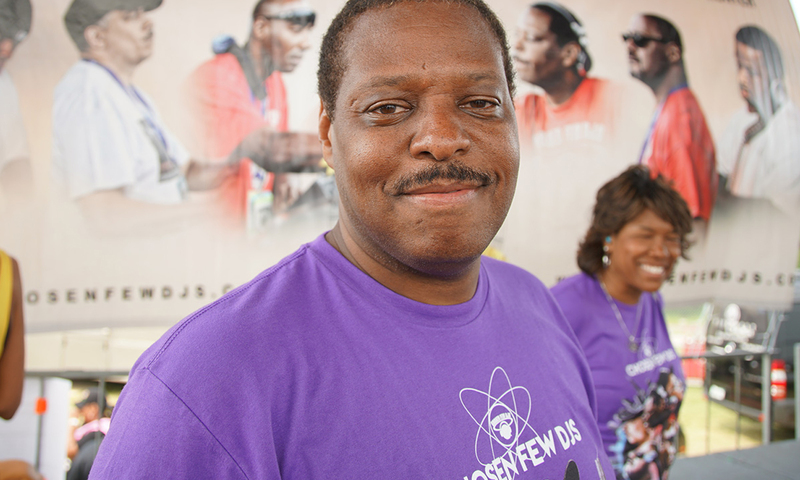 Luckily a good friend of ours that I grew up with, Leslie Hairston, Alderman of the 5th ward stepped in, and took the reins to get us a bigger place and helped us get the sponsorship that we needed to pay for the costs. So in 2007 we moved to the Midway in the University of Chicago, right off of Stony Island. That year we had 10,000 + people come out and stopped traffic on Stony Island for blocks and blocks. So in 2008 they decided we should move to Jackson Park off of 63rd and Hayes, which could hold that amount of people. That year we multiplied again and had about 20,000 people! So they moved us once again to the other side, which was the soccer field where we are to this day. John C: As a pioneer of house music in Chicago, you have experienced the transformation of the genre from a Chicago movement to a global phenomenon. What is your opinion of the direction the genre has gone in since its earliest days? Jesse Saunders: Like everything else and especially every other popular genre music, house music has blossomed and grown into something that I never could have imagined. When I sat in my grandmother’s basement and created all those early tracks and subsequently “Funk You Up” and “Real Love” which became number one radio records, I never thought that it would lead to something like it has today. I did have the vision and the forethought of being a Pioneer and starting something that could grow into some type of phenomenon in itself, but I had no idea how big! All the sub-genres that have been created are just a testament to the fact that house music is a universal language that speaks to everyone and gets deep down in your soul, takes it over and you’re hooked for life! Being able to travel the globe and Witness people testifying to house music in every language and culture has enlightened me to things that I could have never learned through institutional education. I’ve learned that the things we are taught in schools don’t really apply when you go to the countries that the history is born out of. This is led me to a greater understanding about life and the philosophy of interpersonal communication, politics and the corporate manipulation of our society! John C: If you could go back in time and give your younger self one piece of advice, given what you have learned throughout your career, what would that advice be and why? Jesse Saunders: Nothing! Everything that has happened from then until now has been rolled out like a master plan and I’ve been a curious watcher to the vision that I had back in those days. As a rule I have no regrets in life and my biggest accomplishment is understanding that. John C: What do fans have to look forward to over the next year or so? Any big plans you can share with us? Jesse Saunders: I always have a few irons in the fire, but for the rest of 2017 and looking into 2018 there are a couple of things that will be BIG! I can tell you that I’m working on a second book at the moment and I am setting up lecture tours in the US and subsequently internationally as well. 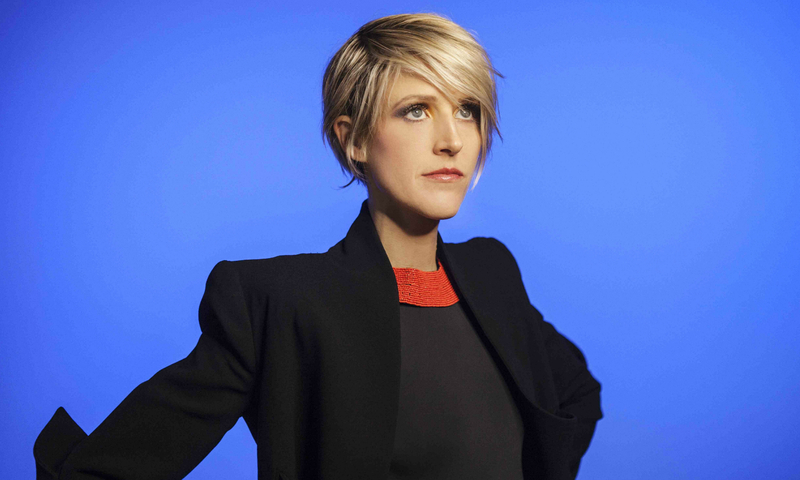 There will definitely be some new music coming your way, as well as more TV specials. Also, look out for some philanthropic events to take place. And the one BIG project coming will blow everybody away. Stay tuned…. John C: Thank you for taking the interview Jesse! 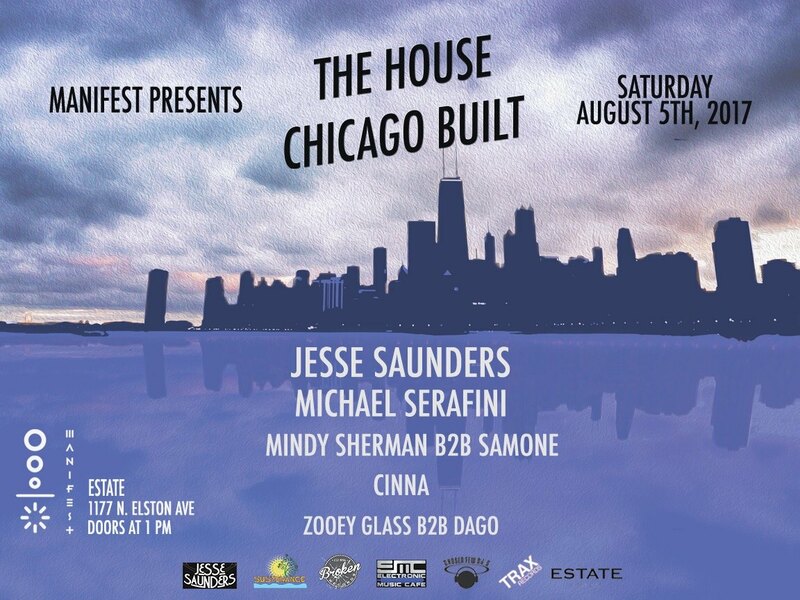 Make sure you catch Jesse Saunder’s performance at the upcoming “The House Chicago Built Event” presented by Manifest. Supporting Jesse’s performance are Chicago favorites Michael Serafini, Samone and Mindy Sherman perfoming back to back, Cinna, and Manifest residents Zooey Glass and Dagō performing back to back. Tickets are available on Resident Advisor.